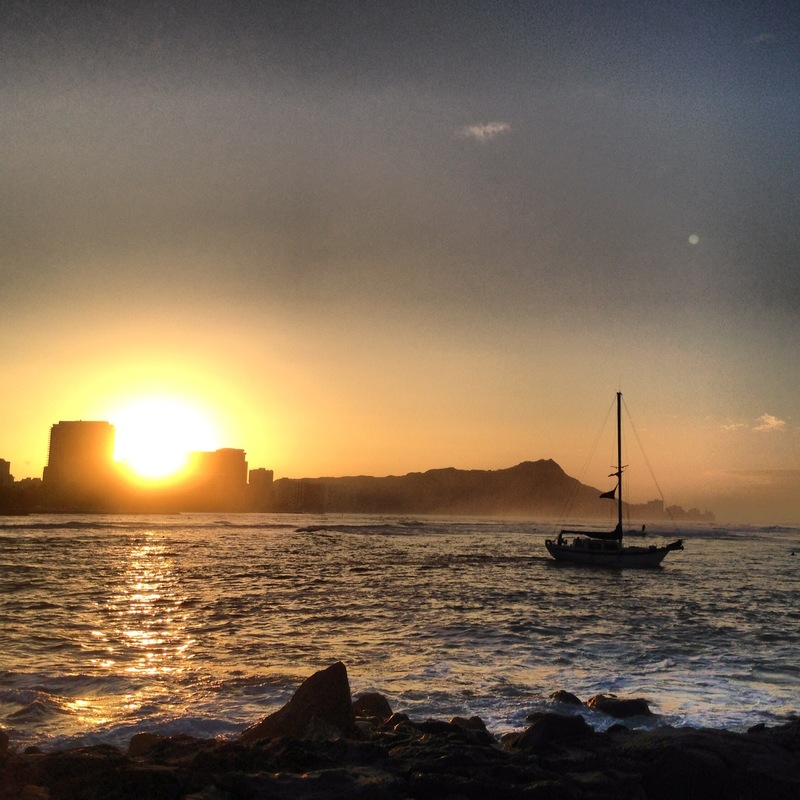 Dr. Jekyll and Mr. Hyde in Hawaii – Hear Me Roar. I have been in the beautiful land of Hawaii since Monday. 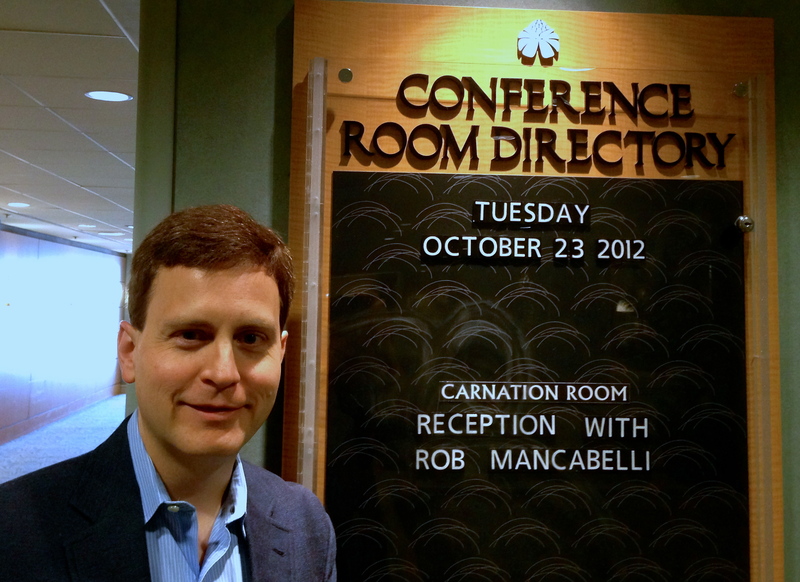 There was an educational conference, and one of the founders of the start-up I’m working at was a speaker. So naturally I came along too. I arrived in a flurry on Monday afternoon – frantically searching for a shuttle to take me to my hotel – and upon realizing I could not check in for another 3 hours – frantically searching for any place showing game 7 of the NLCS series with the Giants vs. the Cardinals. 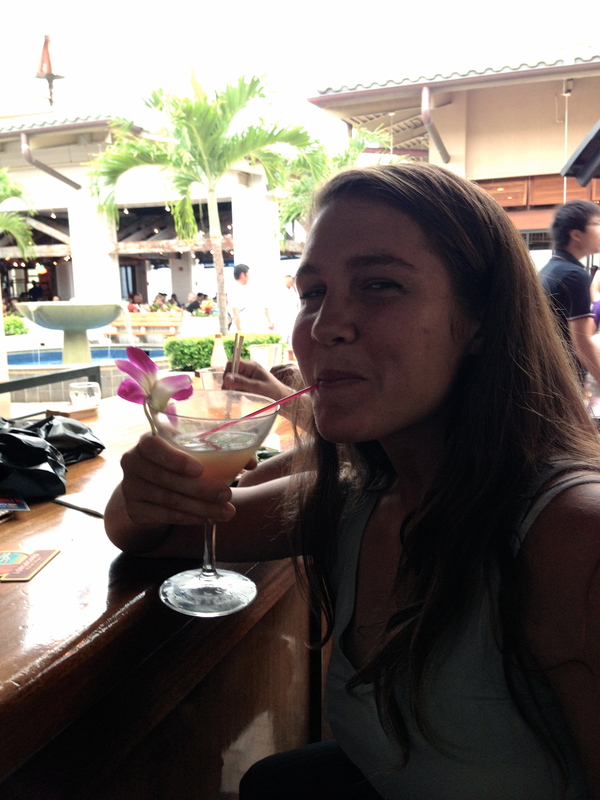 The only place in a 1 mile vicinity was at the Mai Tai Bar on the top floor of the alarmingly massive shopping mall adjacent the Ala Moana Hotel. I found myself surrounded my massive Polynesian men all watching the Monday night football games – completely oblivious to the one TV showing the earth shattering-against all-odds comeback the Giants commandeered. Guess Hawaii doesn’t really do the whole “America’s pastime” thing. Drinking a Mai Tai Tini. Contrary to my expression in the picture, I did not like this drink. Too fruity. The next two days I spent at the conference, attending sessions, schmoozing, networking, conversing, etc., I woke up at 6:30am both days as I was still operating on California time. 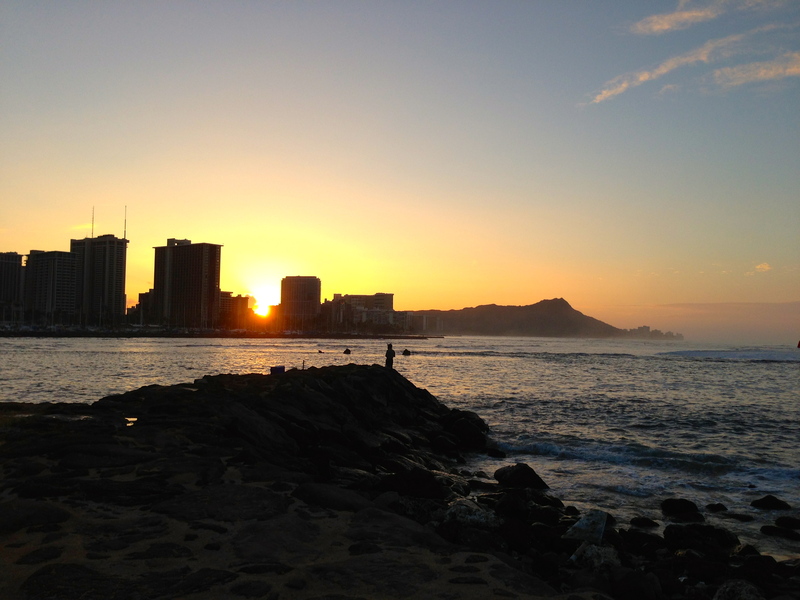 This was early enough where I could check my e-mail, go for a run to the closest pier, and then watch the sun rise awakening Honolulu from its slumber. I would sit a while, fishermen to either side of me, the occasional jogging comrade passing by, and watch the surfers surf the last swell of summer. Time moved differently for these couple days; and by different I mean slow. It was bizarre to be in Hawaii alone and for work. I felt guilty basking in the tropical rays, because I knew it was a work trip and I would be in an office were I back home. 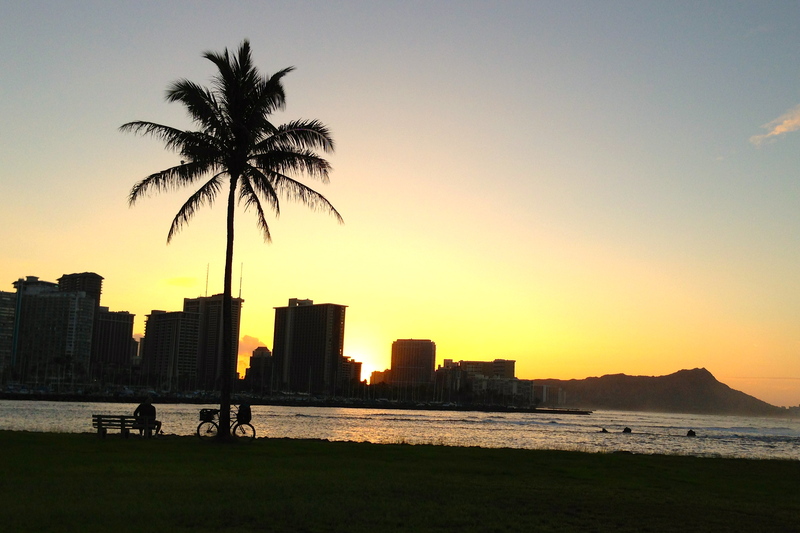 This made it difficult to completely immerse myself in Hawaii and all the luxuries it offers. But I did have a lot of seemingly extra time. And I couldn’t help but think about how I feel like I never have enough hours in the day to do everything I want when I’m home. I don’t have enough time to read leisurely or run daily or cook extravagant meals or watch entire baseball games. But here in Hawaii I found time to run, stay up to date on my work, watch baseball, and just lounge – pondering the world and what Hawaii is and all it represents and how that reflects and relates to the rest of American culture and the endless paradoxes of man seeking paradise yet destroying it and the desire to be removed and isolated from it all yet connected and progressive yet simple and what it all means. So where does all the time go when I’m home? Time vanishes as my calendar fills with the various social gatherings I commit to on a daily basis. Take myself away from my social circle – my community of people – and suddenly I have a whole other life to live! 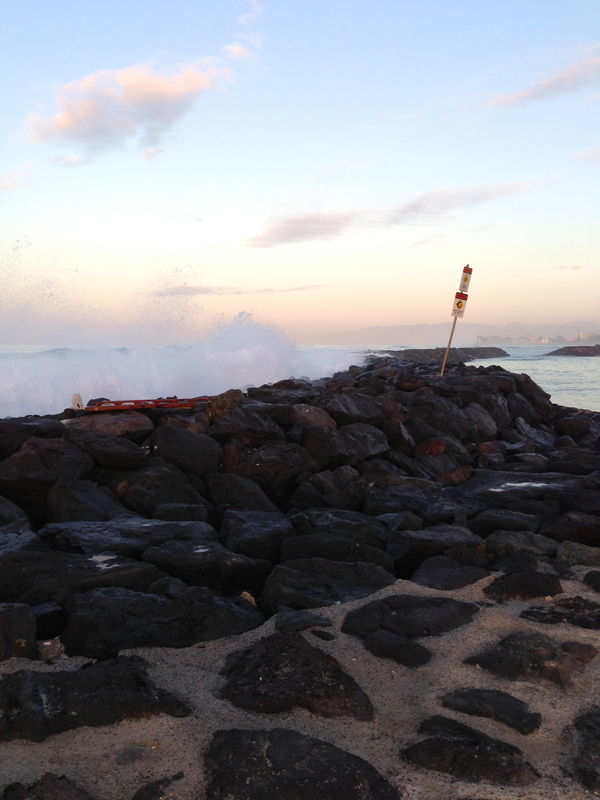 On Thursday my flight was at 8:30pm – so I had the day to enjoy Hawaii without the conference obligations. I went to the beach to read in the sun. And when I felt the transformation to Queen of the Lobsters was complete, I moved to the shelter of the shady grass. A man sat down next to me – very thin, a little older, rasta shorts, yellow bandana, white t-shirt. He noted that he approved of my choice of the grass vs sand and referred to Larry David’s not getting the appeal of sand either in a Curb Your Enthusiasm episode. When he spoke I noticed an accent. He asked if he could put is his mat down next to where I was, and I said sure. Observe the: Foot in the door phenomenon. We began conversing aka I listened while he talked and talked – of being a math professor, but wanting to do comedy, of the art and music scene in Hawaii that he loved but was tired of, of the ethics convention he was coming from. He seemed pretty interesting and harmless, and as I had not had a natural conversation with someone for the past few days I welcomed the company. But as Mom taught very well, stranger-danger alarms were ringing. I made reference to “boyfriend” back in SF and he became very upset at this. The audacity to think that all he wanted from this interaction was the potential of romance. No – he had a girlfriend – and just wanted to say hello and state his approval of my choosing grass over sand. Simple enough. I apologized for the presumptuousness, agreed men and women could be friends and friends always must begin as strangers. I told him I was flying out later, and my only plan for the day was to read, work a little, and watch the Giants game. He didn’t have any other plans – and asked to accompany me slash show me a few local spots. Sounded good. As soon as we started driving I realized something was off. There were a few ticks – he kept commenting on how dirty his front windshield was though it was spotless, that he needed to organize his math books. But no biggie, I can deal with a little OCD and neuroticism. He spoke faster and faster, filtering less and less, and pretty soon his unbalanced psychological turmoil was apparent. He was making references to losing his job, paranoia of the Secretary of State being at the Ethics convention he was at, that it must be more than a coincidence that he met me right after the ethics convention, that he feels like he should move to New York, and needs a life change and to be a better father to his lovechild daughter in Atlanta. I listened, making relatively diplomatic remarks, but also asking much too personal questions. But when you’re only going to interact with someone for a few hours of your life, there’s nothing to lose. No judgment – he could be as honest or dishonest as he wanted, and I could ask really personal questions to try to understand all of his psyche and how all of his life experiences relate. For the next few hours I teetered on the edge of fearing I had gotten myself into a potentially sticky situation with a lunatic and appreciating the trust I have in the world, and the natural goodness of humans. But I started putting the pieces together – and I realized I had agreed to spend the day and be driven to the airport by a man with substance abuse problems – weed, downers, uppers, pills, powders, you name it – who had lost his job as a professor for either sexual harassment or just not showing up to class for extended periods of time. He was severely insecure, lonely, manic, depressed, with major financial problems, and spoke endlessly of the changes he wanted to make. We watched the Giants game at an authentic Hawaii pub, afterwards he showed me the picturesque Puna Lookout point, and then stopped by the Art & Flea which was Hawaii’s version of Art Murmur – A warehouse of local handmade crafts, clothing, jewelry, art, with live music adjacent an organic café. I loved it. He then drove me to the airport, told me a few more jokes, and we parted ways. I know that you may be horrified by the situation I put myself in – and you may be thinking of all the ways that could have gone terribly wrong. But nothing bad happened. I had a wonderful day, really interesting conversation, a taste of local culture, and this man was a total gentleman. Never made me feel uncomfortable in any way, and he went out of his way to be a good host to a complete stranger he will never see again. He may be living a life that is not moral by an objective standpoint. And I may not want to spend more time with him in the future. But I must give credit where credit was due – he was the friendliest, most generous person I met in Hawaii. And for that, I applaud him. The Dr. Jekyll and Mr. Hyde of peoples, places, and things never ceases to amaze me.